Hey Guys and Gals, its that time of year again– The glorious over-exuberant, hyper-manic Christmas shopping season! If you are like me and love to lavish our loved ones, friends, and family with gifts and hate going to the mall to fight the traffic…. Hey wait a minute, now that I am living in the middle of no-where in the Great State of Alaska, the Mall of America, one of my favorite hang outs by the way, is over 4000 miles away, I will be forced to procure gifts by alternate means. I have been known to order some crazy things in the middle of the night from 1-800 numbers and a guy named Billy on TV, so much so that my wife has hid my wallet on occasion. But this year, I am going to showcase some of the greatest gifts known to exist for sale at 2 am. Yes, my rabid reader, I am going to give you the gift ideas of all gift ideas. So sit back and relax, find those credit cards you stowed away during the Great Recession and warm up your touch-tone (or maybe even rotary dial) phone and order away. I bring you 25 Days of AS SEEN ON TV GIFT EXTRAVAGANZA!! I know you have seen this infomercial on TV lately. 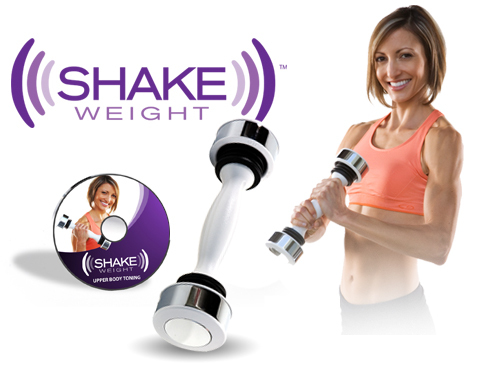 The Shake Weight is today’s answer to exercise! While it is designed exclusively for women, I am sure that flabby guy in your life would love to get into shape in just six minutes a day. Thats right–just SIX MINUTES a day and and he or she can have the body they have always dreamed of! Using a brand new technology called Dynamic Interia, the Shake Weight is guaranteed to tone up arms in just the fraction of time and pennies of the cost of what everyone else is doing at the gyms, health clubs and YMCA’s. They are even offering express processing for just five bucks more so you had better hurry if you want one of these under the tree in time for Christmas morning!